How Much: From "I could swing that as an investment item," to "Wow! That's more than my car!" 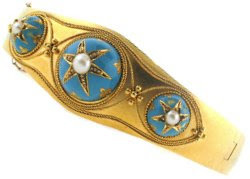 Thanks for posting this gorgeous Victorian bangle bracelet from Beladora.com. We do not use PR and advertising, except for a small amount of Google PPC, because we want to keep the prices of our vintage estate jewelry as low as possible. So we loooove the blogosphere and appreciate everyone who blogs about Beladora. Please sign up to be an affiliate of Beladora.com. We are working diligently on getting our affilate program up and going.